The Republic of Rwanda is a small, mountainous, landlocked country of 26,328 km² located in the equatorial highlands of the Western or Albertine Rift Valley. It is bordered by the Democratic Republic of Congo (DR Congo) and Lake Kivu to the west, Burundi to the south, Uganda to the north and Tanzania to the east. Rwanda has an equatorial climate moderated by altitude. Average annual rainfall varies from 600 mm in the east to 1,200 mm in the central plateau and 2,400 mm on the Congo–Nile divide. Much of the country experiences four seasons; a dominant dry season from June to September, a short rainy season from October to December, a shorter dry season from January to February and a long wet season from March to June. However, the rainy season extends for nine months in the western montane forests. Temperatures are generally mild and stable, with annual means ranging from 14°C to 21°C. However, climate depends locally on various factors such as altitude, exposure, latitude, etc. In the east, for example, the short dry season often extends for longer than the long dry season. Frosts may occur in the mountains along the Congo–Nile divide and snow falls periodically on the highest peaks of the Volcans Mountains. In general, the topography of the country is rugged with an exceptional degree of relief. The west is mountainous; the east is mainly rolling terrain. The lowest-lying part of the country at 800 m is in the south-west, in the area around Bugarama, and is an extension of the Imbo region of Burundi. The Congo dominates the western half of the country–Nile watershed or divide, a chain of highlands running north-south at between 2,000–3,000 m, on which the remaining montane forests occur. The northernmost part of this highland is of volcanic origin and includes Karisimbi, one of Africa’s highest mountains (summit 4,507 m). To the west of these mountains, the land falls steeply to Lake Kivu on the floor of the rift valley. The centre of the country, east of the mountains, is dominated by a plateau at 1,500–2,000 m, dissected by many rivers. Finally, in the eastern and south-central parts are the savanna regions of the Akagera basin and Bugesera, lying between 1,300–1,600 m, which merge into the extensive wetlands and papyrus swamps that lie along the international border with Tanzania. 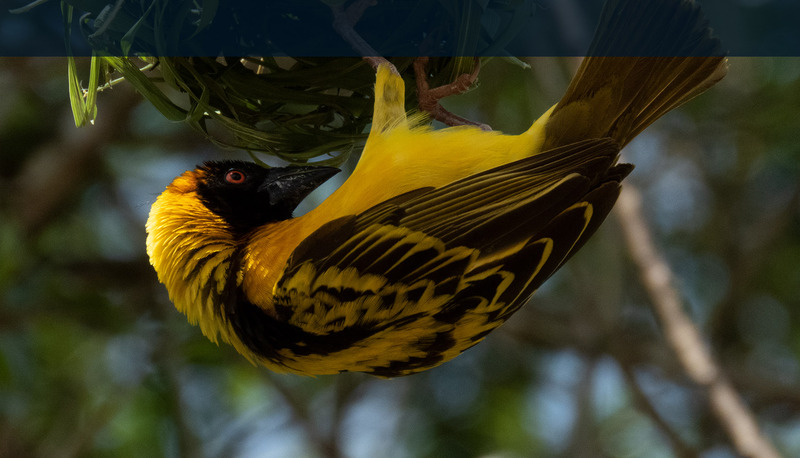 As a result of the varied topography, Rwanda contains a remarkable diversity of habitat-types hence a prolific birdlife. Two significant phytochoria occur; the Afromontane region between 1,800 m and 4,500 m and the Lake Victoria regional mosaic below 1,800 m, which, in Rwanda, includes elements of Guineo–Congolian and Sudanian vegetation. Most of Rwanda’s forests lie in the Afromontane region where they form part of the forests of the Albertine Rift, the flora, and fauna of which show a high degree of endemism. Until recently, there were four main montane forests in Rwanda, Nyungwe, Gishwati, Mukura and Volcans, located in the west of the country, where they effectively form the boundary between Guinea-Congo lowland rainforests of DR Congo and the Lake Victoria far south-east where the vegetation is Acacia- and Combretumdominated woodland basin to the east. Their high altitudes of 2,000 m characterise them on average, varying from 1,600 to 4,500 m and the clearings and dense understorey typical of montane forests. Wetlands occupy almost 10% of the country. It is said that Rwanda is made up of a thousand hills, and between each of these there are small rivers and wetlands. There are three extensive areas of the swamp; Akanyaru on the border with Burundi, Mugesera– Rugwero in the south-east, and the Kagera swamps along the Tanzanian border in the east. Smaller swampy areas occur in the high valleys and the form of many extensive bogs in the mountains and on the central plateau. Some 90% of the water of the country drains into the Nile Basin with only a small proportion flowing into the Congo River system. Many wetlands in Rwanda are under considerable pressure from agricultural expansion.